About Unforgettable by Ronda Gibb Hinricksen: Haley has always admired her strong-willed great-grandmother Grisa. The woman survived the disappearance of her husband and thrived after her immigration to America at the beginning of World War II. But when a shocking telephone call from a detective in Germany turns Haley’s life upside down in an instant, she finds herserlf questioning everything she thought she knew about her heritage. The body of Ulrich Krauss has been found, and the renowned toymaker and artist has a shocking connection to Haley: he is her great-grandfather—not missing, but murdered. Now, at the request of her ailing great-grandmother, Haley travels to Germany to seek answers. What she finds instead are more questions and a growing sense of danger dodging her every step. Protection appears in the form of Joshua, an attractive man from Haley’s pas who is in Germany on business. Together th epair embarks on an emotional quest for the truth, only to discover that a generations-old plot is very much alive, and there are those as determined as ever to keep the facts surrounding Ulrich’s death hidden—even if it means silencing his great-granddaughter for good. My review: I love to read a good suspense book, especially when it also includes a touch of romance! 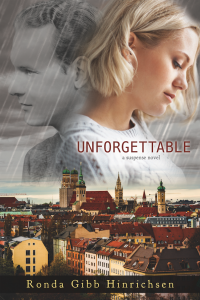 Unforgettable by Ronda Gibb Hinricksen is both and it’s done so well! I loved the way that the book begins with Ulrich. The reader knows at least kind of what had happened to him, at least partially, throughout the book. Of course, the characters have no idea. Haley didn’t have any idea that he hadn’t been killed in World War II. I really liked Haley. She was willing to take a break from her job, and maybe even miss the death of her beloved great-grandmother to go on a mission to Germany for her. There she faced danger at almost every turn. It was not a trip for the faint of heart. I liked that she was able to keep her wits about her and do what she needed to do, even with seemingly everything against her. Lucky for Haley, she was met by Joshua, a friend of her brother. He was willing to drop what he was doing and help her pretty much every day, with anything she needed. Together they face the danger and the craziness that comes Haley’s way. It was interesting in this one not to have the second voice be Haley’s love interest. The second voice in this one is the bad guy, Otto. I liked the way the author had the reader see what was coming for Haley through his eyes. It was one of those books where you just want to shout at the character to not walk into the house, because you knew that someone or something bad was waiting for her. I really liked the plot of this one. I enjoyed the family history element. And the history in general. I learned at least a little about World War II Germany and the pictures that are actually still missing from this time period. I also really liked how the title, Unforgettable, plays into this book. This book is so well done! Make sure you take time to read it yourself!